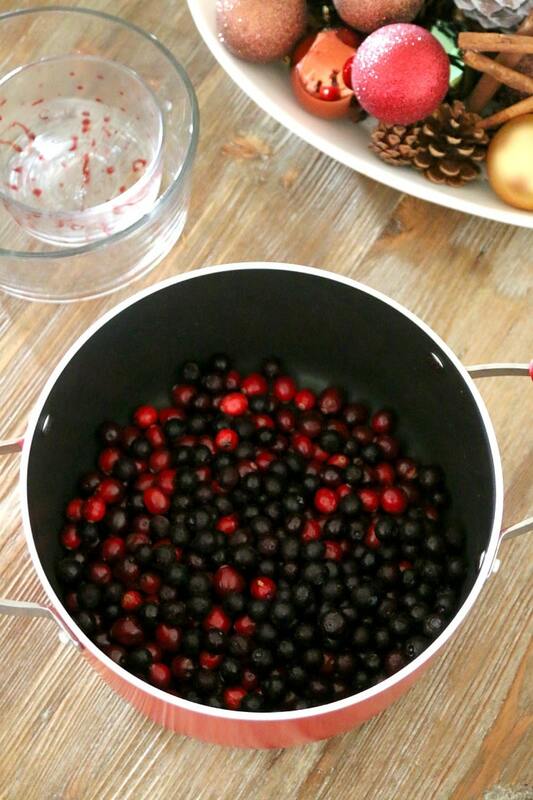 This Cranberry Blueberry Sauce Recipe is first and foremost easy. But second, its so delicious you will find yourself over the pot begging for a taste! As a side dish, delightful, but as a topping for your pie? Irresistible. For the longest time I thought I hated cranberries. I mean..how could I love them? They showed up in a metal can and came out a sort of jellied cylinder shape. I would reluctantly carve myself a slice and throw it on my plate as a kid, forcing it down with a glass of milk. As an adult I have ignored that stuff like the plague and then holiday, a few years into my marriage, I decided to actually attempt to make my own cranberry sauce. I could NOT believe how easy it was. The basis of most cranberry sauces start with two things: Fresh Cranberries and Sugar. After that what you add is really up to you. The original recipe I tested had OJ in it. The OJ is acidic in and of itself so this is more of a tame traditional cranberry sauce, but you could skip the OJ and add…well…anything. Ever since then cranberry sauces (Fresh ones!) have been back on the holiday menu. And this year while meandering through the world of food blogs, I came across a Cabernet Cranberry and Blueberry Sauce recipe that sounded delicious. The problem was- I don’t drink alcohol. I do have some for cooking but we drink it so rarely that generally its disgusting by the time I get around to using it. Even so I wanted to give this version a try but twist it for those that do not drink. Deliciousness! This is hands down one the BEST versions of sweet cranberry sauce you will ever taste! 1) Add all your ingredients into a sauce pot. Make it one of the big ones you make soups in- cranberries really can swell up and you do not want an overflow. 2) Bring pot to a boil then down to simmer, stirring on occasion, for about 20 minutes. 3) Once your 20 min are up, take off heat source to cool down. Honestly this is the best part- we were all surrounded by the pot dipping in spoons and it is SO delicious warm! I put mine on some apple pie, which really isn’t the goal of cranberry sauce, but lets just say YUM. Tip: You do not have to use the Welches Blackberry sauce but the Cranberry, Blueberry and Blackberry together were fantastic. I would recommend picking this one up! Its a really thick robust flavor. This cranberry sauce was such a hit at Thanksgiving, even with my ULTRA PICKY daughter, that I have already made a secondary batch for us to eat again (that’s the one shown above!!). 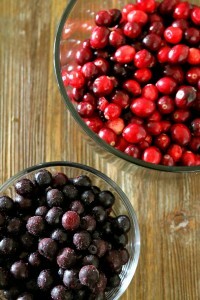 If you have left over cranberries, learn how to make cranberry juice with them! 1 cup of Welches Blackberry juice trust me! Add all your ingredients into a sauce pot. Make it one of the big ones you make soups in- cranberries really can swell up and you do not want an overflow. Bring pot to a boil then down to simmer, stirring on occasion, for about 20 minutes. Once your 20 min are up, take off heat source to cool down. Honestly this is the best part- we were all surrounded by the pot dipping in spoons and it is SO delicious warm! I put mine on some apple pie, which really isn't the goal of cranberry sauce, but lets just say YUM.